Got a bunch of boards from Olly to attempt to repair. One of them is a tiny New Zealand Story PCB. 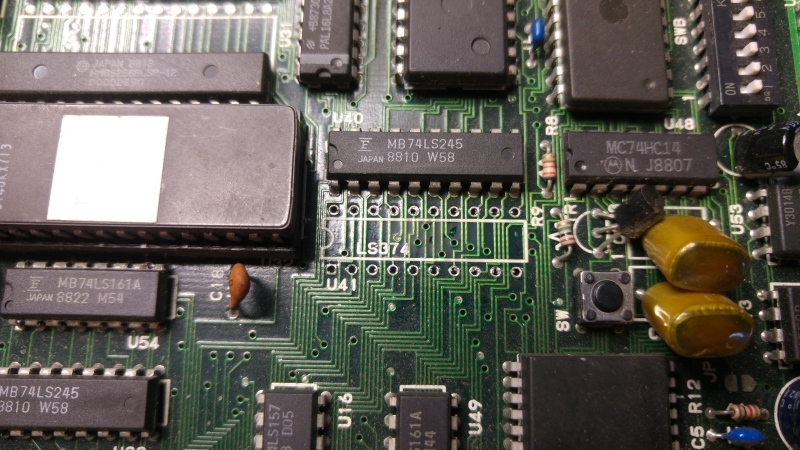 There is a broken custom resistor array on this PCB. Turns out this SIP is for DAC for the green colours. Not really sure how this could have happened. Caius is sending me a replacement for it but it plays no further part of this repair. 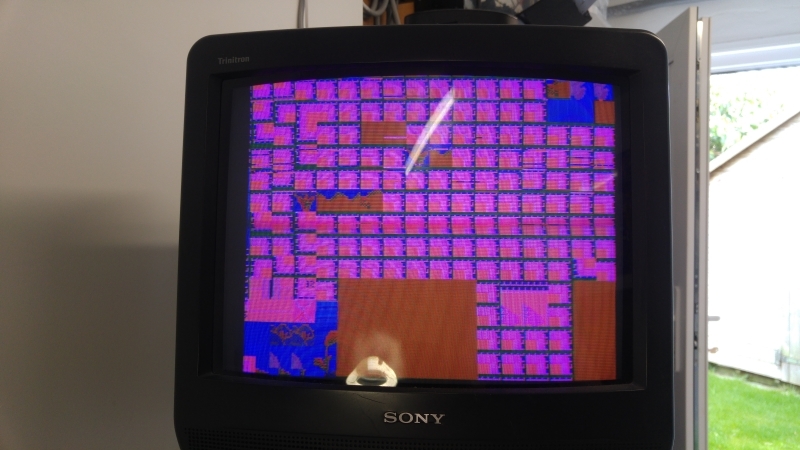 The game plays blind behind this wall of garbage so we know the CPU is doing its job. 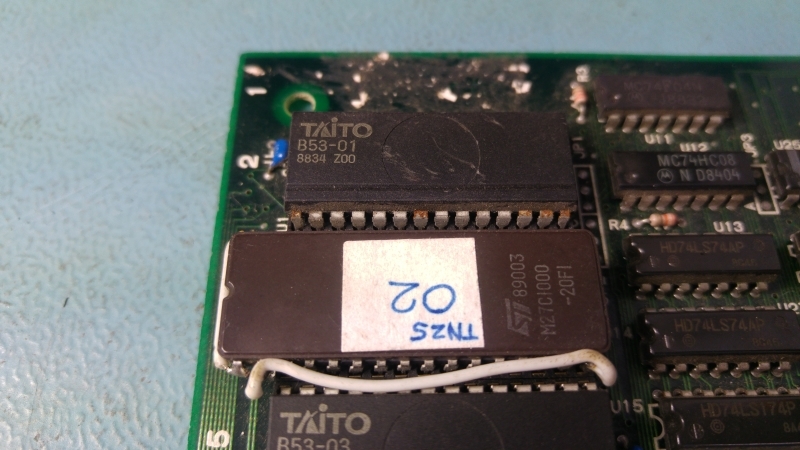 The board has quite a few Fujitsu TTL chips on it so my first bets were on failed TTL. The PCB is also tiny which makes this job pretty quick. 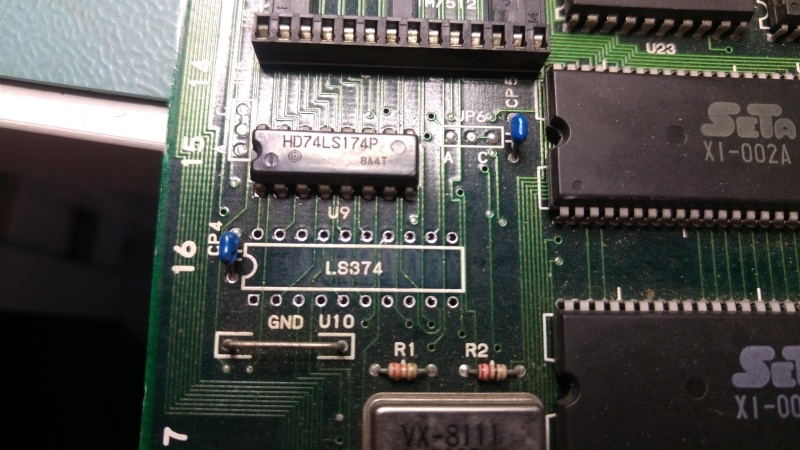 In my experience of failed Fujitsu chips I found that pins go completely dead and this PCB was on different. I found a couple of 74LS374 chips at U41 and U10 with dead outputs and these are easy to spot with a logic probe. As the outputs were dead I could quickly test by ‘piggybacking’ a known good chip on top of it. The changes were good enough to confirm. I replaced these two chips. Replacing them did give a big difference and I could now see all the outputs from those two chips were once again active. The graphics were all messed up still. Next I see that one of the MASKROM’s has been replaced. They are 23C1000 compatible and therefore there is no 28 pin EPROM replacement available. 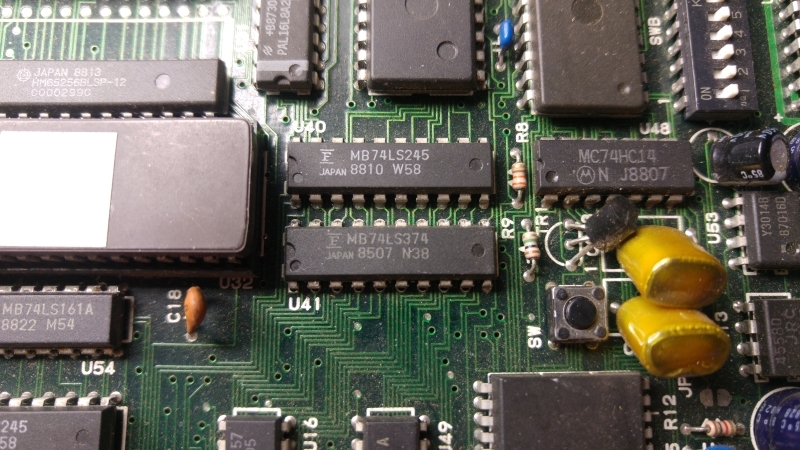 It has been replaced with modified a 27C1000 chip. This mod is not part of the problem. I pulled all the other MASKROM’s and dumped them. 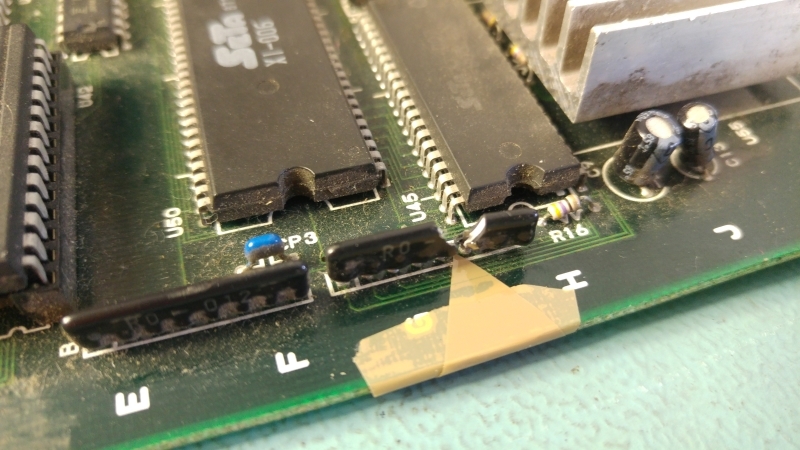 4 of them actually failed so in the short term I replaced them with modified 27C301 EPROM’s. All the graphics came back good. There is a 128×8 ROM replacement PCB available from OSHpark shared projects made by system11 so I downloaded the Eagle board file, added a little TNZS graphic to it and ordered some up. The A298010AV chips however are really quite hard to source so Ive got to wait until February before these come in from back order! As it stands now the game is fully playable with only the green colour issue. I will replace the resistor array SIP once it gets here. 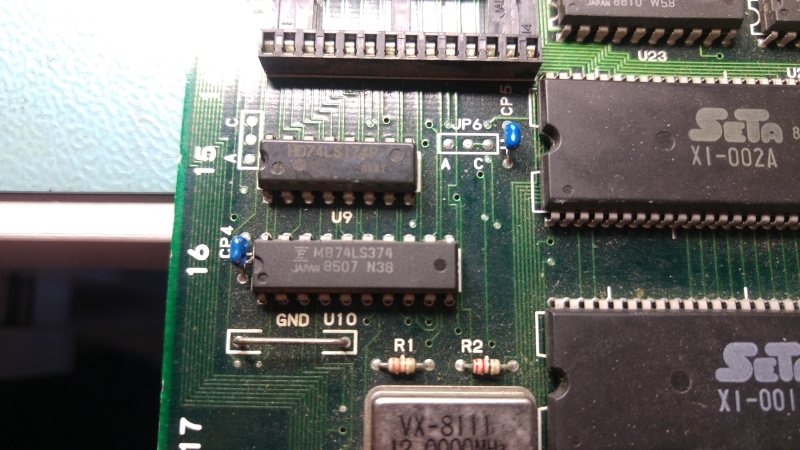 I used system11’s pcb as well for a Lifeforce mod like he did in his blog. I bought the flashmemory model: AM29F010B-55EI and it worked like charm as well! Where did you get your 29F010B chips from and were they a reasonable price?